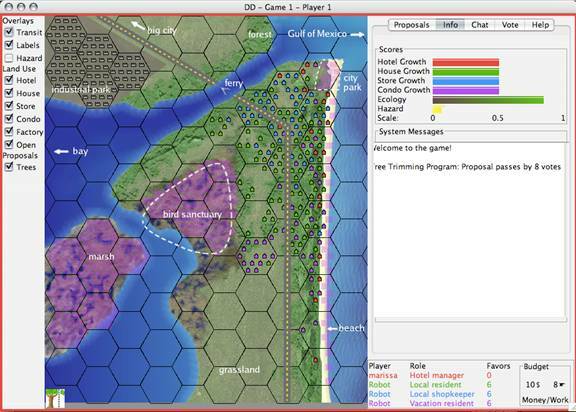 Hurricane Landing is a computer game that teaches its players about community planning through experiential learning. It is set in a city located on a small barrier island somewhere along the Gulf Coast. The game is designed for four players who are connected to one another via the Internet. 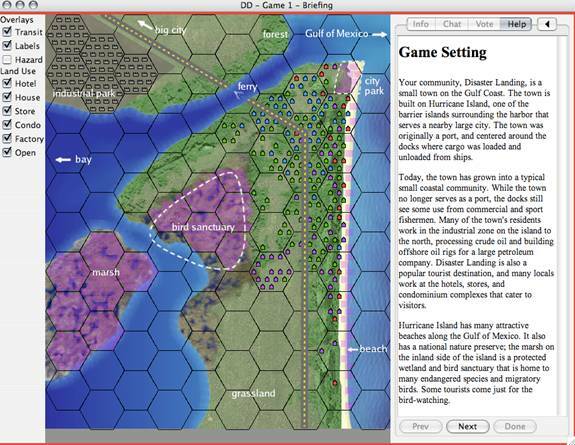 This document will teach you how to navigate the game's interface and the basics of how to play. Before the game begins, each player is assigned one of four roles: hotel manager, local resident, local shopkeeper, or vacation resident. Throughout the game, each player's job is to represent the interests of his or her respective citizenry in the small city while participating in collective decisions about how to improve the city. There are three rounds in the game. Each round represents a particular event in the city's history. Several years pass between rounds. 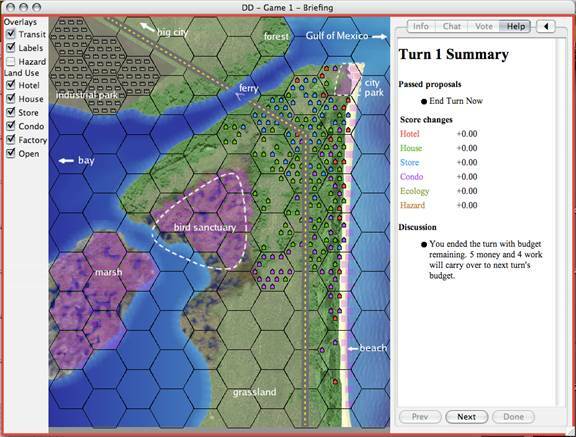 Each round begins with a briefing that explains the scenario for that round, the problems the players face, and the resources they have available. The round ends when all the proposals have been voted on, or when the players run out of budget. The basic gameplay consists of understanding the city's current situation and available options for future change, submitting proposals for consideration by other players, negotiating with other players to find acceptable compromises, and resolving the proposals by vote. This walkthrough was created using a game with 1 human player and 3 robots. This screen explaining the Game Setting is the first thing that you will see when the game opens up. Here, you will get information about the fictional town where the game takes place. Click to continue to descriptions of the Player Roles. There are four player roles: hotel manager, local resident of the town, local business owner, and vacation resident of the town. You will be playing the game from the viewpoint of your chosen role. Pay close attention to the description of your role so that you can really get into it during the game. Click again to read about the Round 1 Scenario. This will give you an idea about your community's current situation. Finally, click to begin the first round. The game display will appear once all of the players are ready. 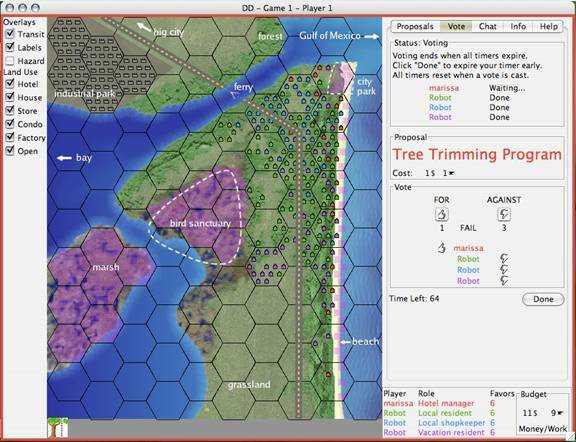 The left-hand side of the screen shows a map of Hurricane Island and its surrounding area, and the right-hand side of the screen shows the control panel for the gameplay. You are currently under the tab. This screen shows a list of the proposals on the left which can be put on the table for a vote during this round. On the right is the , with the colors corresponding to the player colors shown at the bottom of the screen. 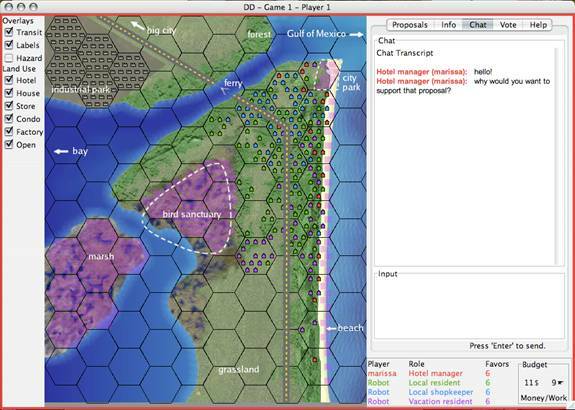 The gives the other players a quick overview of your opinions, which helps with debates and negotiations. 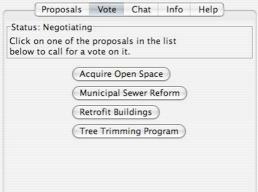 You can show your opinion about any of the by highlighting the proposal and then clicking the or button. If you want to support one of the conditionally, click on the button and type in your conditions. Your fellow players will see your condition when they hold their mouse over the mark that shows up in the opinion poll. You can change your opinion at any time or withdraw it completely with the button. The map located to the left of the display shows a bird's-eye view of the city. The blue areas on the map represent water, while the greens and browns are land. The map is divided up into hexagons; each hexagon is about a mile across. Keep in mind that the house-shaped icons displayed on the map represent multiple buildings, not individual structures. For example, if half of the icons in a hexagon are blue, it means that roughly half of the total acreage of the area is being utilized by shops, shopping centers, and other commercial buildings. The little anvil ( ) represents units of work. Notice that the Total Cost of the proposal is listed as , which means that the proposal costs one unit of money and one unit of work. You can compare these numbers with your current Budget, which is shown at the bottom right-hand corner of the screen. At the start of Round 1, your budget is , so passing this proposal would leave you with . Click on for more information about the Tree Trimming Program. This will put you under the tab, which also contains all of the scenario information. Click on the tab to get back to where we just were. 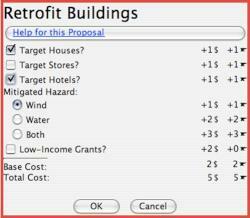 Let's say you want to propose the initiative to Retrofit Buildings. Highlight and click on the button. Keep in mind that each player can only propose each pending proposal one time. Then check the boxes next to your desired options listed for the proposal (not all proposals have different options) and click . The proposal is then listed under in your player color. If a proposal doesn't have any options to configure (for example the Tree Trimming Program) you don't have to click ; just click on the button. You could call for a vote now, but you might want to build support for it first. You can negotiate proposals by chatting with the other players or by making statements of conditional support. You can type your responses by clicking in the space under the Input label. Try to get into the role you are playing in the game. What would someone with your role think about the proposal that is being discussed? If you change your mind about a proposal you made, you can always retract the proposal before it goes to vote. To do this, highlight the proposal and then click on the button. Keep in mind that you can only retract a proposal if you were the one who proposed it. You can also a proposed initiative if you were the one who proposed it. Highlight the proposal, then click and make your selections. This option is useful if you have negotiated different options for a given proposal. When you think its time to vote, go to the tab, where each of the proposals on the table are listed. You can click on any of the proposals on the list to start a vote on it. Let's vote on the . You can cast your vote by clicking on either or . You can cast one vote each time a vote is called, but you can also get extra votes by using favors. You can vote more than once, but each time you do, you will use up one of your favors. One vote equals one favor, and you only have six favors for each round. Notice that a timer begins counting down when a vote is called. You get 120 seconds to cast your vote; otherwise the proposal will either pass or fail without you. Each time a player votes, the timer resets to 120 seconds. You can use this time to negotiate. If you're satisfied with the outcome and don't need to negotiate any further, click to expire the timer early. 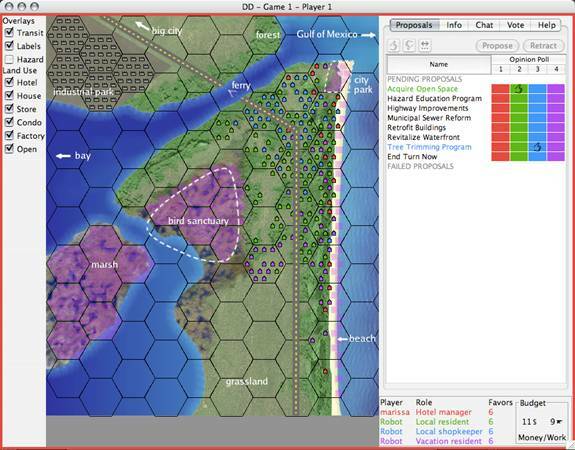 It may take a few moments for the game to finish applying the effects of the passed proposal to the scenario. After a vote takes place, the game automatically switches to the tab to show you how the island is changing as a result of your decisions. The colorful bars at the top of the display show different measures of your city's condition and allow for you to gauge how the island's real estate, economy, ecology, and hazards are changing as a result of the new initiatives. Do you like what's happening? How would the person with your role view things? Try and ask yourself these questions as you go along. Notice that your Budget has decreased, the Map is showing the new proposal, and that the section of the screen is logging important information about the main activities that have taken place. Refer to the System Messages at any time if you are confused about what has happened. If a proposal gets voted down, it will still be listed on the page, and will now also be listed under the section. Even though the proposal failed once, it doesn't mean that it can't be voted on again. However, someone else has to propose it since each player can only propose something once. If there is a tie, the proposal is tabled and can be voted on again when/if someone else decides to propose it. When does the round end? The round ends when there is not enough work or money remaining in the Budget for any of the proposals to be passed. Notice that there is also an option to End Round Now under . You can vote on ending the round just like any other proposal- if the proposal to end the round passes, the round ends. What happens at the end of a round? Let's walk through what happens when Round 1 ends. When the round is over, a screen comes up labeled Round 1 Summary, which details the Passed Proposals and Growth that took place during the round that was just played. Click , and you will see a new screen entitled Development, which shows the Growth that has taken place over the past few years. Remember, several years pass between each round. Click again and another informational screen will come up, explaining what takes place on the island following Round 1. Click and you will be shown the Round 2 Scenario and a list of the Problems the island is now being faced with. Click , and you will be shown a list of the Round 2 Proposals. Then click to begin the second round. You will be taken through similar screens after the second round. Keep in mind that there are a total of three rounds in the game and that at the beginning of each round you are given a new budget which is shared among the players and half of any leftover budget from the previous round(s). Round 3 will come to an end in the same way as the first two rounds, and you will see how the community has changed as a result of the initiatives passed in the third round. You will then be able to review the flow of events that occurred throughout the entire game, including the decisions you made in each of the three rounds, the problems that arose, and the resolutions of those problems. A discussion should follow. Enjoy!